This is one of those tips that comes from me making myself NUTS over and over until I figured out the easier way. Perhaps you’ve had the same experience? 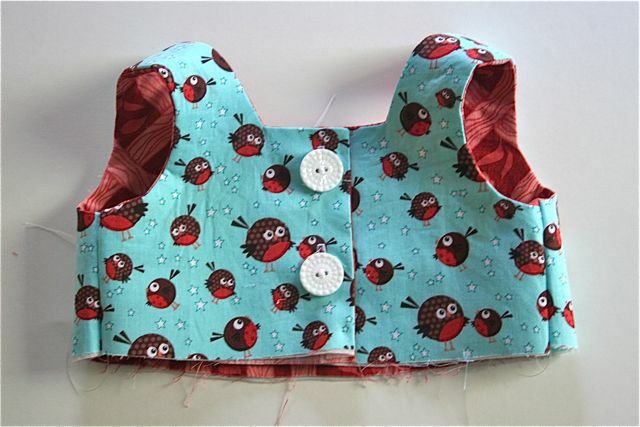 When assembling a bodice for a dress where the upper portion of the dress has buttons and the lower portion does not–which is to say, any situation where there are buttons above the waistline seam but not below–install the buttonholes and buttons BEFORE sewing the waistline seam. That way, the bodice parts will lie flat while you’re putting in those buttonholes, and you won’t have to struggle to access the opening, swear while the buttonholes go in crooked, rip out stitch after stitch, or break a needle and nearly lose an eye (all those happened to me at one point or another while I was figuring this out). The skirt on the dress above, for example, is a little gathered dirndl, which is sewn together and fitted over the bodice lower edge to be stitched in place. If the buttons and buttonholes aren’t installed first, getting to that back edge is a nightmare of logistics–and sometimes, can’t be done at all. Additionally, I like the lower button to be spaced just right in relation to the seam allowance at the waistline seam; putting in the buttonholes before that seam is sewn makes it easier for me to be sure my placement is correct. Not every dress goes together this way, but for those that do, knowing when to put in the buttonholes–not always as the last step–is invaluable. Hope that’s helpful, and that you’re heading into what looks to be a lovely weekend! This is one of those things you think is obvious but only comes from doing, thanks for the hot tip! Thanks for SHARING! This is very helpful. I am going to explore your .com… LOOKS NICE!